We did discuss about various fashion designers and their online designs . If you're in hurry and want to order a lehenga online then MYNTRA is no bad option. Myntra is one of my favourites to purchase products online. Plus you get good things and good quality. You get the authentic and genuine stuff. You won't get any fake products. They are very much reliable. I have never received any cheap or fake product yet. But at times I've not been comfortable with the size or colour of the product that I order so there is an amazing option of return or exchange here. You return or exchange your product and after a period of almost 6-7 days you receive your money in the form of Myntra credit or you get the money directly into your bank account. You can replace your product. I've been very comfortable with Myntra. It has made my task of shopping easier. I select the brands and then accordingly I buy my products. This was just a description for those who are not used to buying online. Myntra provides amazing deals time to time . Here are some of the collections I saw on Myntra and thought of sharing with you guys. If you're looking for a bridal lehenga then you can check the link below. 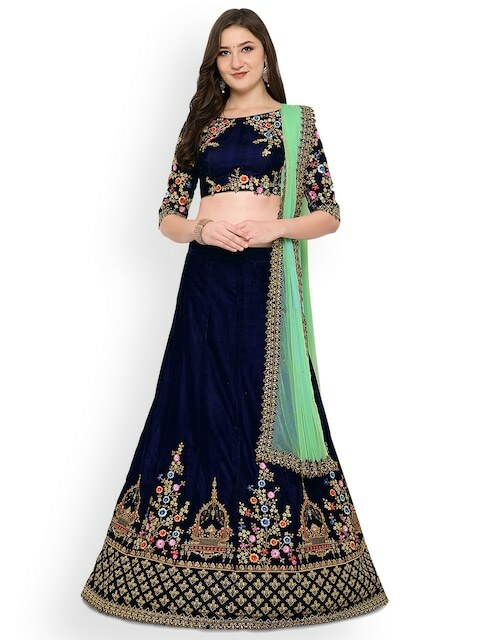 This is a navy blue and green lehenga available on the Myntra. This is an embroidered lehenga which has been made to perfection. The colour is enough to attract you and the viewers. This is totally authentic and is just so perfect. Also, this is a semi stitched lehenga. This is another good lehenga I found on Myntra. This is pocket friendly product. It is semi stitched and is done beautifully. The silk lehenga is just perfect to make you look elegant.The product is authentic and genuine . 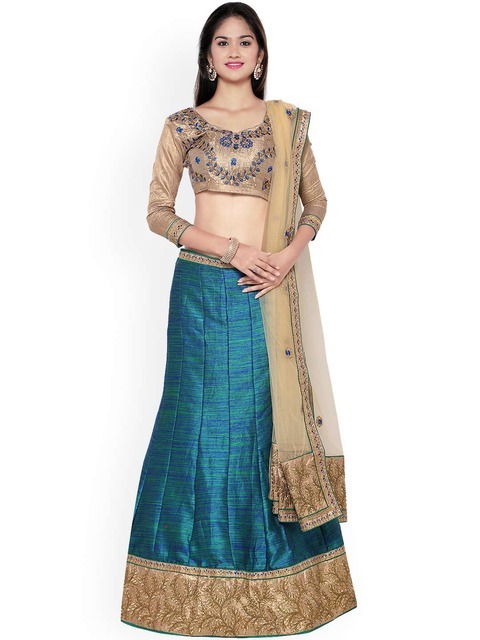 It is a perfect lehenga to wear on occasions and events. The colour is very appealing.